Originally titled, “Lear Offshoot 1”, I changed the name for its world premier in Tokyo Japan because there seemed to be no useful translation for the word, “offshoot”. Hence, the new name is what it will remain. The piece was finished in June of 2015. 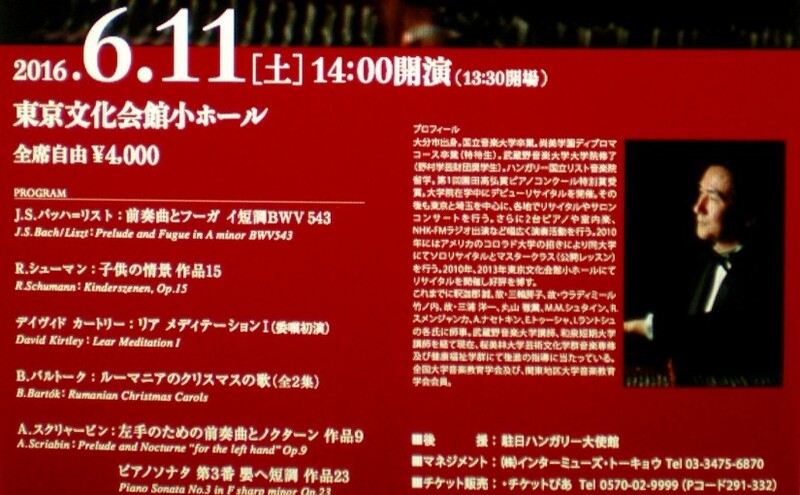 It is performed here by Kazuhiro Miura, for whom it was written, in this world-premiere performance on June 11, 2016 in the Tokyo Bunka Kaiken. The work is a meditation on Shakespeare’s great play, The Tragedy of King Lear. In the opening of Act I, the old king has called his family together to inform them he is retiring from the cares and responsibilities of head of state and wishes to hand over the management of the country’s affairs to “younger strengths.” He has, therefore, decided to divide his kingdom among his three daughters: Goneril, the oldest and wife to the Duke of Albany; Regan, wife to the Duke of Cornwall; and Cordelia, a young maid, for whose love the King of France and Duke of Burgundy are at this time in Lear’s court as joint suitors. The king has called his daughters together to hear from their own lips which of them loves him most, so that he might partition his kingdom among them in direct proportion to their love for him. The proud king’s decision to reward Goneril and Regan for their false declarations of love and to disown and disinherit Cordelia for her honest statement of love, leads to the tragedy that ensues.